A look at the current 90-man roster shows the Seahawks will have some tough calls to make. Roster building in the NFL never really ends. Teams can, and do, make changes any and every day of the year. But the passage of free agency, the NFL Draft, and then rookie mini-camp and the signing of undrafted free agent and tryout players, means Seattle now has a 90-man roster that could remain fairly stable for a little while (though reiterating that stable is a really relative term in the NFL). And that also means it’s the perfect time to unveil our first 53-man roster projection for the 2018 Seattle Seahawks (okay, maybe there’s never really a bad time, but this seems better than most). No doubt, a lot can and will change between now and the first week of September, when the initial 53-man roster will actually be set. But if nothing else, this projection can serve as a guide for how the roster looks today and the primary position battles that may arise. KEEP: Russell Wilson, Alex McGough. CUT: Austin Davis, Stephen Morris. COMMENT: McGough, a seventh-round pick, was tabbed by coach Pete Carroll as one of the surprise players of mini-camp. And if so, that could give him a leg up on the backup QB job — if he looks good at all in the preseason the Seahawks probably wouldn’t want to risk losing him via waivers. The question then would be if the Seahawks would keep a third QB — it’d be a little risky going with a rookie seventh-round pick as the backup to one of the best QBs in the NFL. But Wilson’s durability has usually compelled the Seahawks to go with just a lone backup. And there’s always a few veterans available on the street if need be. KEEP: Mike Davis, Rashaad Penny, C.J. 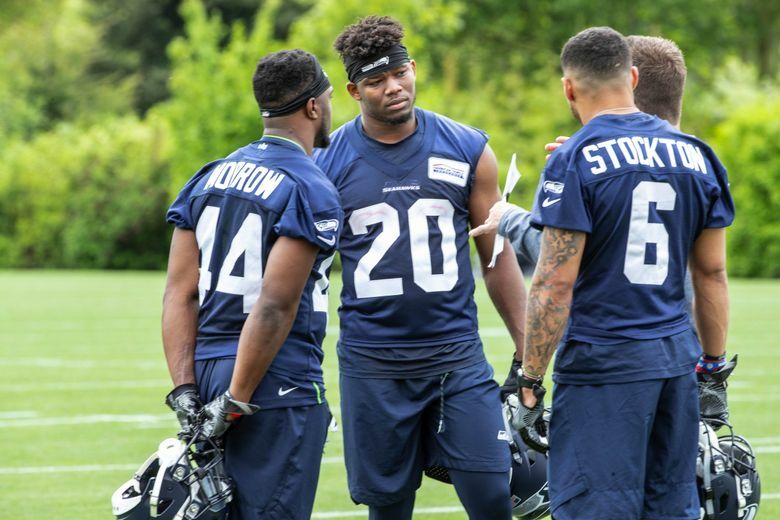 Prosise, Chris Carson, J.D. McKissic. COMMENT: You might think a team that’s talked all offseason about running the ball better — maybe not necessarily more, which can be an important distinction — might have more tailbacks on hand (and it’s worth noting again at all of these positions that there will be players who will become available and a lot that can still change, so none of this is set in stone). But the fivesome Seattle has now could well be what it takes into the regular season. Davis is the most at risk contract-wise — Seattle could save almost $900,000 releasing him. Prosise has the most to prove — if he can’t stay healthy through camp then he could well be shown the door, especially with the Seahawks appearing confident in Penny’s receiving ability. But if healthy, Prosise has some unique traits that will keep him around. McKissic also adds lots of versatility. CUT: Tre Madden, Khalid Hill, Marcus Martin. COMMENT: So here’s what appears a completely wide-open battle with no real favorite other than that Madden and Fowler have each appeared in NFL games before. But Hill and Martin, each undrafted free agents, are each bigger backs who might also be better fits for what the Seahawks appear to want to do this season. I’m siding for now with Fowler — who played in 42 games with the Titans the last three seasons — almost solely due to his experience and to reinforce that I think Seattle will keep a fullback this season. But I have no real idea which one it will really be and I doubt the Seahawks do, either. KEEP: Ed Dickson, Nick Vannett, Will Dissly, Tyrone Swoopes. COMMENT: I think the first three listed about are just about locks and the Seahawks seem pretty high on Swoopes, a former quarterback at Texas who could bring a unique skillset to the position. But if it comes down to two players for one spot here it’ll likely be Vannett versus Swoopes. Hard to see Dissly not making it given the investment the team put in him. KEEP: Doug Baldwin, Tyler Lockett, Amara Darboh, Jaron Brown, David Moore. CUT: Tanner McEvoy, Cyril Grayson, Marcus Johnson, Damore’ea Stringfellow, Caleb Scott. COMMENT: Seattle has usually had at least six receivers on its roster. But the value of some of the players at other spots could mean Seattle could get away with just five — Prosise and McKissic can line up as receivers, and tight ends can as well. If I had to pick a sixth it’d be Johnson, whose entrée to make the team will be how well he performs on special teams in the preseason. He’s been cited by some around the team as potentially having a Ricardo Lockette-type impact as a gunner. If Seattle went with just five, he’d likely battle Moore for the last spot. McEvoy will have to show more as a receiver to make the roster for a third straight year, which he did largely due to special teams. Stringfellow is intriguing given how long the Seahawks have been following him before finally signing him this week. He may have to beat out Moore for a spot as a big receiver at the back end of the rotation. KEEP: Justin Britt, Ethan Pocic, Germain Ifedi, D.J. Fluker, George Fant, Duane Brown, Jamarco Jones, Rees Odhiambo, Jordan Roos. CUT: Joey Hunt, Marcus Henry, Avery Young, Skyler Phillips, Nick Callender, Isaiah Battle, Willie Beavers. COMMENT: The first six listed above would seem locks to make it, and if Jones does much of anything he likely has a pretty good shot at a roster spot, too, given the team’s surprise that he was available where he was in the draft. Odhiambo and Roos are each young players that the team feels still have a lot of room for growth, though their spots are hardly secure, especially with a new OL coach on hand. But admittedly, of the nine I have above making it, there is no true backup center among the four backups (Pocic can also play center but as of now appears slated to a starting guard spot), which means Hunt and Henry — each listed as centers — are also worth watching. Or maybe the Seahawks will be comfortable enough with the knowledge Pocic can handle the center spot if needed. KEEP: Jarran Reed, Frank Clark, Nazair Jones, Dion Jordan, Rasheem Green, Tom Johnson, Quinton Jefferson, Marcus Smith II, Shamar Stephen. CUT: Malik McDowell, Marcell Frazier, Jacob Martin, Branden Jackson, Noble Nwachukwu, Poona Ford, Eddy Wilson. COMMENT: It’s going to be a really different-looking defensive line group without Cliff Avril and Michael Bennett manning the end spots for the first time since 2012. Rookies Frazier, Martin, Ford and Wilson will all be given long looks, and Jackson – who had some nice moments last year — also can’t be discounted. Of those, Ford may have the best shot to make it as an interior lineman. Expect some kind of roster move with McDowell by the time camp rolls around. But for now, he’s on the 90-man roster. KEEP: Bobby Wagner, K.J. Wright, D.J. Alexander, Shaquem Griffin, Barkevious Mingo. CUT: Warren Long, Emmanuel Beal, Jake Pugh. COMMENT: You can ink in Wagner, Wright and Mingo as the three starting LBs, and Griffin seems a lock as one backup with Alexander having a pretty good head start at the other. But at the moment there doesn’t appear to be a true backup in the middle and it won’t be a surprise if there is further roster juggling at this position. KEEP: Shaquill Griffin, Byron Maxwell, Justin Coleman, DeAndre Elliott, Tre Flowers. CUT: Neiko Thorpe, Mike Tyson, Dontae Johnson, Akeem King. COMMENT: The top three seem set as the starters (Coleman as the nickel), though Maxwell will get competition from Johnson, a starter last year with the 49ers. Johnson’s contract, though, doesn’t assure a roster spot and Seattle could side with younger players for backup roles if he does not emerge as a starter — Elliott in particular could be the backup nickel. And the Seahawks could save $1.85 million releasing Thorpe, which leads to the idea they’ll look long and hard for someone who can do what he does. Flowers is the most obvious candidate if he can make the transition well enough from college safety to be a fifth cornerback — his college resume indicates he can handle the special teams part of it. KEEP: Earl Thomas, Bradley McDougald, Delano Hill, Tedric Thompson, Maurice Alexander. CUT: Tevon Mutcherson, Alex Carter. COMMENT: Assuming no trade happens now, Thomas will return as the free safety with McDougald as the strong safety, assuming also that Chancellor won’t be healthy when the season starts. The nature of Chancellor’s contract all-but-assures a 90-man roster spot but Seattle would likely place him on the PUP (Physically Unable to Perform) list if he cannot pass a physical when camp starts (unless he retires or some other settlement is worked out before then). Alexander, a former starter for the Rams, and second-year players Hill and Thompson seem primed for backup roles. KEEP: Sebastian Janikowski, Michael Dickson, Tanner Carew. CUT: Tyler Ott, Jason Myers, Jon Ryan. COMMENT: Yep, there’s a real chance that the entire kicking battery could be completely new in 2018. His contract gives Janikowski the edge at place kicker and his draft standing indicates Dickson will unseat Ryan at punter — Ryan has held the job since 2008. And just a hunch that Carew, a rookie from Oregon, could win the snapper job.